With free Wi-Fi and make-your-own waffles at the free breakfast buffet the pet-friendly Best Western Plus A Wayfarer's Inn & Suites gets high ratings from our guests. Each of the 101 rooms in this two-story hotel has a microwave fridge and a cable TV with more than 50 channels including HBO. Rooms also have coffeemakers large desks and free Wi-Fi. The free breakfast buffet includes scrambled eggs sausages oatmeal and fresh fruit. Work off some calories in the exercise room and try a few laps in the seasonal outdoor pool. The hot tub is open year-round. Free high-speed internet access is available in the business center and lobby where you can also pick up a free weekday newspaper. Parking is free. 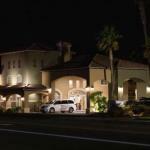 Just off I-40 the hotel is seven miles from Kingman Airport and Industrial Park. There's a golf course two miles away and an antiques shopping district three miles away. The Grand Canyon Skywalk is a two-hour drive. For natural beauty closer to home visit the Hualapai Mountain Park 13 miles away. McCarran International Airport in Las Vegas is 104 miles from the hotel.